Although ticks are commonly thought of as insects, they are actually arachnids similar to scorpions, spiders, and mites. All adult ticks have eight legs and have no antennae. Adult insects by comparison have six legs and one pair of antennae. Ticks are parasites that feed on the blood of their host, which can be an animal or a human. "Ticks are efficient carriers of disease." Ticks are efficient carriers of disease because they attach firmly when sucking blood, feed slowly and may go unnoticed for a considerable time while feeding. Ticks take several days to complete feeding. What are the different types of ticks? There are two groups of ticks, sometimes called hard ticks and soft ticks. Hard ticks, like the common American dog tick, have a hard shield just behind the mouth parts (sometimes incorrectly called the head); unfed hard ticks are shaped like a flat seed. Soft ticks do not have the hard shield and they are shaped like a raisin. Soft ticks prefer to feed on birds or bats and are seldom found on dogs or cats. What is the life cycle of the tick? Females deposit from 3,000 to 6,000 eggs on the ground. Adult ticks seek host animals to feed on, and after engorgement on blood, they quickly mate. Male hard ticks usually die after mating with one or more females, although some may continue to live for several months. Females die soon after laying their eggs in protected habitats on the ground. The life cycle requires from as little as 2 months to more than 2 years, depending on the species. After the egg hatches, the tiny larva (sometimes called a seed tick) feeds on an appropriate host. The larva then develops (molts) into the larger nymph. The nymph feeds on a host and then molts into an even larger adult. Male and female adults feed and mate on the host; the female falls to the ground to lay her eggs, continuing the life cycle. How did my dog get ticks? Ticks wait for host animals on the tips of grasses and shrubs. When the plant is brushed by a moving animal or person, the tick quickly lets go of the vegetation and climbs onto the host. This is a process known as questing. Ticks can only crawl; they cannot jump or fly. Some species of ticks will crawl several feet toward a host. Some tick species can be active on winter days if the ground temperatures are above 32 °F (0 °C). Are there certain ticks that I should be concerned about? Although there are at least 15 species of ticks in North America, only a few of these species are likely to be encountered by your dog. They include American dog tick, lone star tick, deer or black-legged tick, and brown dog tick. Other tick species may be encountered in various regions. Ask your veterinarian if you need additional information about a specific species. The American dog tick feeds on a wide variety of hosts, including humans and dogs, but rarely infests homes. Adults are chestnut brown with white spots or streaks on their backs. Engorged females become slate gray and may expand to a length of 1/2” (10-12 mm). Larvae and nymphs feed mostly on small rodents, while adults feed on dogs, cattle, other animals, and humans. 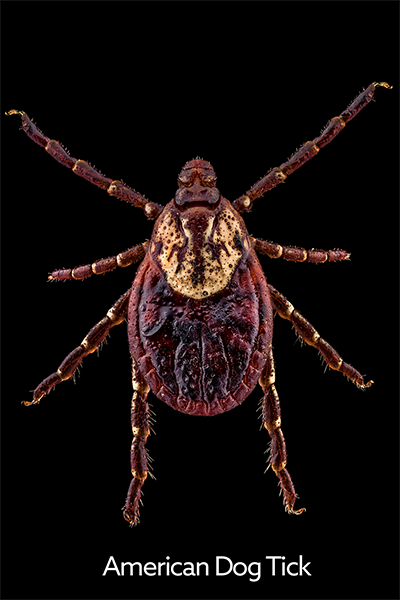 These ticks are widely distributed throughout the Midwest, the Pacific Northwest, and eastern United States, as well as east of Saskatchewan in Canada. They are attracted by the scent of animals, and humans most often encounter them near roads, paths, trails, and recreational areas. Although present all year round, American dog ticks are most numerous in the spring. The female dog tick lays 4,000 to 6,500 eggs and then dies. The unfed larvae crawl in search of a host and can live up to 540 days without food. Nymphs can live without food for up to 584 days. That's over a year-and-a-half! Adults crawl in search of dogs or large animals for a blood meal. Adult American dog ticks can live for up to two years without food. They can be found in a waiting position on grass or other low vegetation along roads, paths, and trails. As an animal passes by, the tick will crawl onto it and soon start feeding. The males remain on the host for an indefinite period of time alternately feeding and mating. The females feed, mate, become engorged, and then drop off the animal to lay their eggs. "Adult American dog ticks can live for up to two years without food." The American dog tick requires from three months to three years to complete a life cycle. It typically is dependent on climatic and environmental conditions for its eggs to hatch. Adult lone star ticks are various shades of brown or tan. The female has a single silvery-white spot on their back and males have scattered white spots. After feeding, females may be 1/2” (10-12 mm) long. Larvae and nymphs parasitize small wild animals, birds, and rodents, while adults feed on larger animals such as dogs and cattle. "Lone star ticks live in wooded and brushy areas." All three stages of the lone star tick will bite dogs and humans. These ticks live in wooded and brushy areas and are most numerous in the underbrush along creeks and river bottoms and near animal resting places. 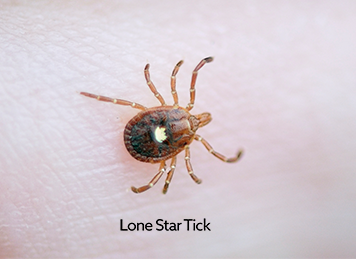 Lone star ticks are present throughout the year, but peak populations may occur from March to July. Regionally, they can be found in the Midwest, eastern, and southeastern, and United States. The range of the lone star tick may be expanding with the re-introduction and increased populations of white-tailed deer in many areas of the eastern US. 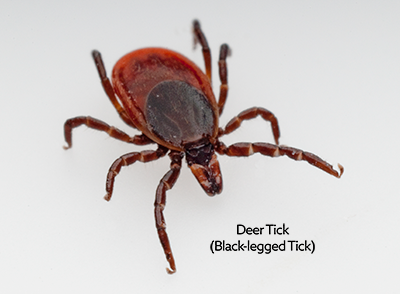 All three active stages of the deer or black-legged tick will feed on a variety of hosts including dogs and people. After the eggs hatch in the spring, the very tiny larvae feed primarily on white-footed mice or other small mammals. The following spring, the larvae molt into pinhead-sized, brown nymphs that will feed on mice, larger warm-blooded animals, and people. "These ticks are usually found in wooded areas along trails." In the fall, they molt into adults that feed primarily on deer, with the females laying up to 2,000 eggs the following spring. Adults are reddish-brown and have a dark brown or black shield-like shape between their mouth parts and body. These ticks are usually found in wooded areas along trails. They are distributed through the Midwest and eastern United States, as well as throughout Canada with the highest proportion in Ontario. The larvae and nymphs are active in the spring and early summer; adults may be active in both the spring and fall. The deer or black-legged tick can transmit Lyme disease and possibly ehrlichiosis and anaplasmosis to dogs and humans. The brown dog tick (also known as the kennel tick) is found through most of the United States and Canada and can transmit ehrlichiosis. This tick feeds on dogs, but rarely bites people. Unlike the other species of ticks, its life cycle allows it to survive and develop indoors which means it can establish itself in colder climates. 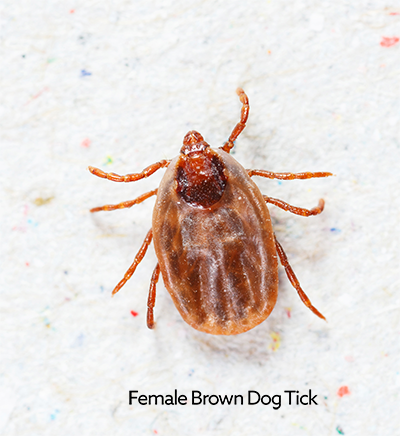 The brown dog tick is found primarily in kennels or homes with dogs, where it may be found hiding in cracks, behind radiators, under rugs and furniture, and on draperies and walls. "This tick is tropical in origin and does not survive long, cold winters outdoors." The adult is reddish-brown and usually attaches around the ears or between the toes of a dog to feed. After feeding, a female may engorge to 1/2” (10-12 mm) long. She then drops off the dog and crawls into a hiding place where she may lay as many as 5,000 eggs. This tick is tropical in origin and does not survive long, cold winters outdoors. How can ticks be prevented? There are many different types of tick preventatives available in the marketplace. Some products are available over the counter, while others are only available through your veterinarian. There are effective monthly preventatives that are typically applied to the skin at the back of the neck and represent a convenient method of control for these external parasites. This includes Frontline Plus® (only available in the USA) and Advantix®. In recent years, the topical preventive Bravecto® has been developed and lasts for 3 months when applied topically. Additionally, there are chewable products such as Nexgard® and Simparica® that are given monthly; or chewable Bravecto® which is given every 3 months. Your veterinarian will make specific recommendations to keep your pet parasite free. What should I do if I find a tick on me or my dog? Use fine tipped tweezers or disposable gloves to handle the tick. If you must use your fingers, shield them with a tissue or paper towel. Infectious agents may be contracted through mucous membranes or breaks in the skin simply by handling infected ticks. 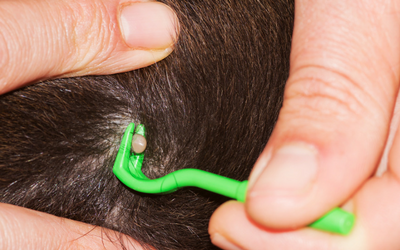 This is especially important for people who de-tick pets because ticks infesting dogs and other domestic animals can carry multiple diseases capable of infecting humans. "Infectious agents may be contracted through mucous membranes or breaks in the skin simply by handling infected ticks." Grasp the tick as close to the skin surface as possible. This reduces the possibility of the head detaching from the body upon removal. Pull the tick straight out with a steady, even pressure. Continue applying steady pressure even if the tick does not release immediately. It may take a minute or two of constant, slow pulling to cause the tick to release. There are also tools available called Tick Twisters or Tick Keys which can be useful. However, take care to use them cautiously as twisting or jerking the tick may cause the mouth parts to break off and remain in the skin, increasing the chances of infection. After removing the tick, thoroughly disinfect the bite area and wash your hands with soap and water. Home remedies such as applying petroleum jelly or grease, or touching the rear of the tick with a hot match do not work effectively and are not recommended. These techniques cause the tick to salivate and can actually increase the chance of getting a disease. "Home remedies, such as applying petroleum jelly, will cause the tick to salivate and can actually increase the chance of getting a disease." After removing the tick, you may wish to preserve it in rubbing alcohol for identification. Be sure to label the container with information about the time and place where the tick bite occurred. This will help you to remember details of the incident, especially if a rash or other symptoms associated with Lyme disease appear later. This information will be of help to a veterinarian or physician diagnosing an illness.